After it’s opening in 1979, the Joe Louis Arena has grown and gained it’s popularity and is now one of the most visited in the Detroit, Michigan area! 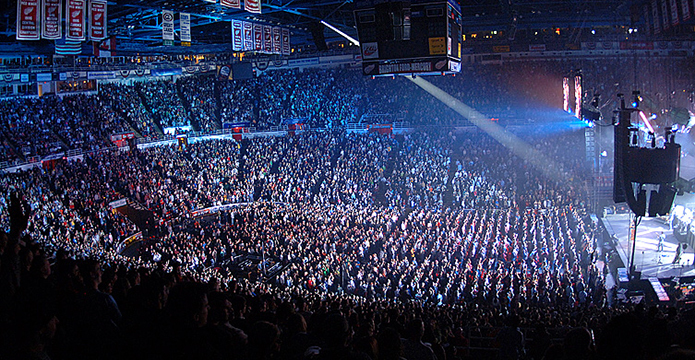 This impressive arena is home to some of the biggest sports events including NHL’s Detroit Red Wings. And due to it’s size, latest technology and full rounded layout – catching all of the live action has never been easier! Detroit is known for it’s wonderful music scene, including the world-famous Jazz festival that is held annually on Labor Day weekend, to give fans a real taste in local, historical, raw and emotional music. A trip to this city would not be complete without a visit to Joe Louis Arena. So, if your interests lie more in the performing arts then look no further, this venue plays hosts to a roaring crowd singing along an endless list of artists as they take to the stage time and time again.